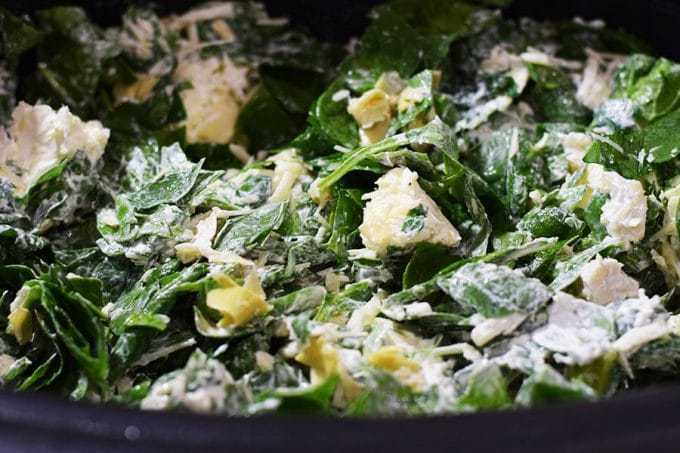 Oh so good and absolutely effortless, this Slow Cooker Spinach and Artichoke Dip is the perfect appetizer for any occasion. This time of year can be hectic and busy. It’s a good idea to simplify and plan ahead, whenever possible, so that you don’t have to do everything all at once. 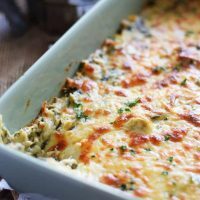 This Slow Cooker Spinach and Artichoke Dip is a great appetizer that can be assembled the night before and made in the slow cooker the day of your party. I don’t know about you but I seriously cannot resist a good dip. Especially a warm and gooey one. It just has my name written all over it. What about you? Are you a chips/crackers n dip kinda person? Ready for how easy this is? – Here is what you need! In a bowl combine all ingredients and mix well. 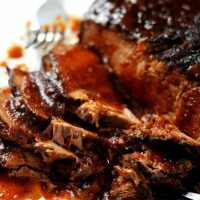 You can do this in the slow cooker as well.Spray Slow Cooker with Cooking Spray. Place slow cooker on high for 2 hours or on low for 3 to 4 hours and cook until warm and cheeses are melted. Stir to make sure well combined and taste to adjust salt as needed. 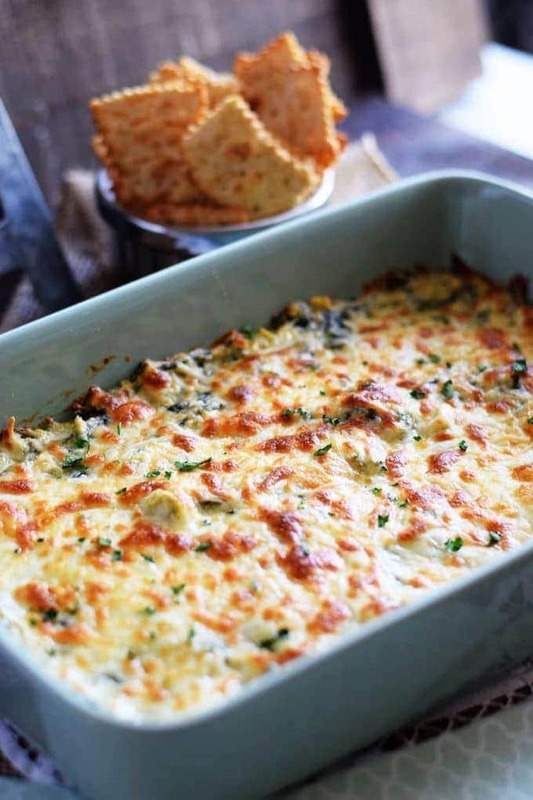 Transfer to a serving dish, top with addition cheese, if desired, and pop under the broiler to make cheese golden brown or leave in slow cooker and serve warm! Tip: This is also good served cold. 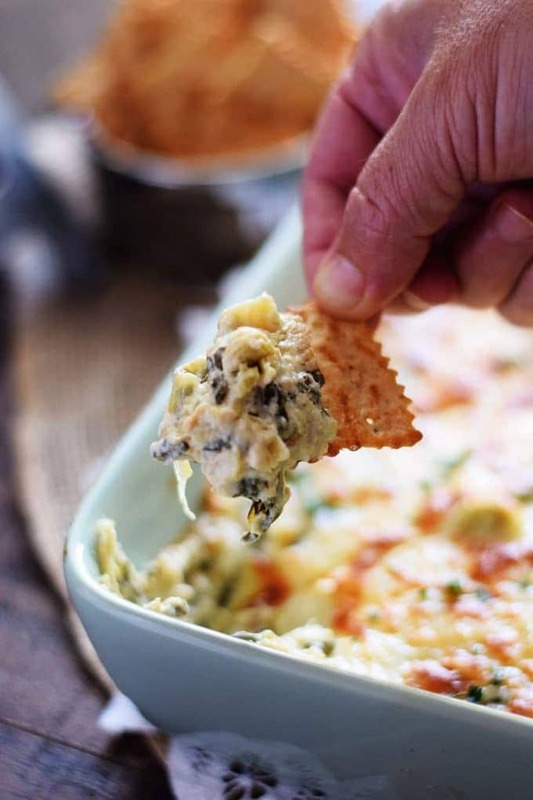 Leave off the topping, Make ahead and let cool some before refrigerating in an air tight container.Serve with crackers, tortilla chips, or bread pieces. You can find this at two of my favorite link ups Meal Plan Monday and Weekend Potluck! 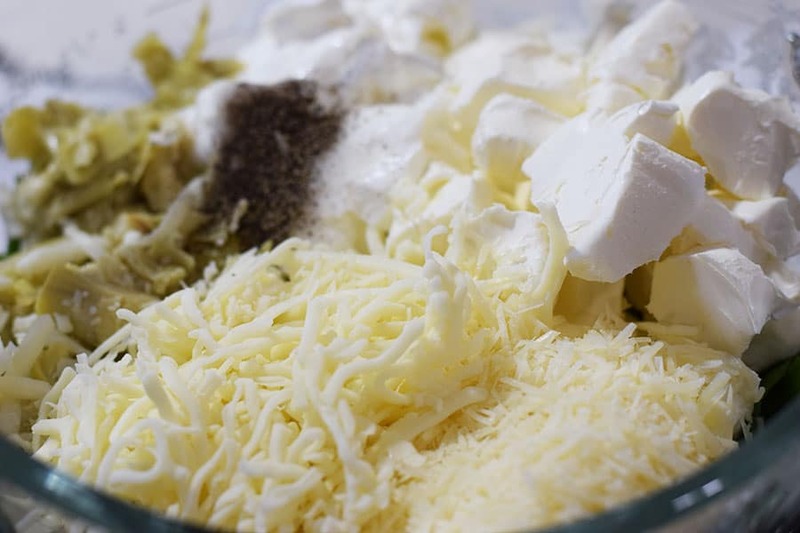 In a bowl combine all ingredients and mix well. 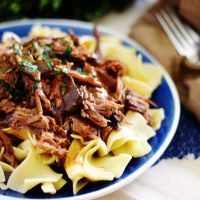 You can do this in the slow cooker as well. Transfer to a serving dish, top with addition cheese, if desired, and place in oven under the broiler to brown cheese for a minute or two (just watch it so it doesn't burn) or leave in slow cooker and serve. This can also be made the day before. Let cool down a bit and then store in air tight container and served cold. Stores well in refrigerator for up to three days. Mmm, would love to dig into this! And making it in a slow cooker makes it doubly good! 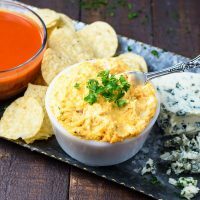 This is one of my favorite dips! I love that you made it in a slow cooker. Love this dip! Would never have thought to make it in a slow cooker! David, I love it too! 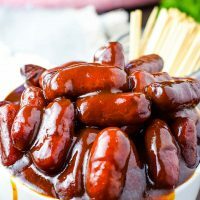 The slow cooker makes it easy and a great way to keep it warm for a party too! 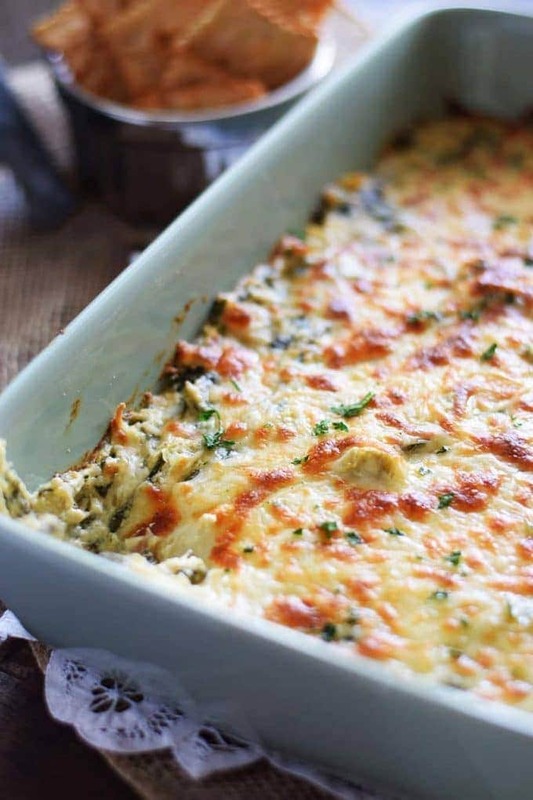 We are total sucker for spinach dips. And I love the cheese on top. Perfect for an appetizer. Ooh, I love, love the slow cooker option. I’m going to be without a kitchen for months and this will be perfect for the Super Bowl, etc!! Love that cheesy topping! Liz, I love using my slow cooker! I saw the pictures of all the exciting things going on at your house! I can’t wait to see when it is finished!